The Big Bang theory proposes that the universe began as an extremely hot and dense dot only a few millimeters wide. It since grew over 13.7 billion years into the vast and cooler expanding cosmos that presently exists. An extension of the Big Bang model, inflation, poses that the universe initially expanded far faster than the speed of light and grew from a subatomic size to a golf-ball size almost instantaneously, shown in this diagram. 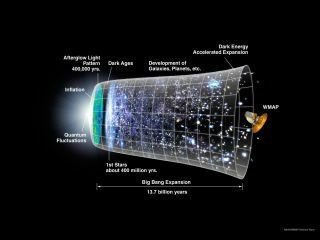 It took quite a bit more than seven days to create the universe as we know it today. SPACE.com looks at the mysteries of the heavens in our series: The History & Future of the Cosmos. This is Part 2 in that series. The Wilkinson Microwave Anisotropy Probe (WMAP) has produced a new, more detailed picture of the infant universe. Colors indicate "warmer" (red) and "cooler" (blue) spots. The white bars show the "polarization" direction of the oldest light. This new information helps to pinpoint when the first stars formed and provides new clues about events that transpired in the first trillionth of a second of the universe. Snapshot from a computer simulation of the formation of large-scale structures in the universe, showing a patch of 100 million light-years and the resulting coherent motions of galaxies flowing toward the highest mass concentration in the center. This image shows primordial dwarf galaxy candidates circled in green. Three enlargements at right show several dwarf objects that are at the limits of Hubble's present instrument capabilities in September 2004. The Hubble UDF is a small region of sky in the direction of the southern constellation Fornax. The faintest objects are less than one four-billionth the brightness of stars that can be seen with the naked eye. One scenario envisioning the creation of the earliest stars suggests that dark matter particles are very light and can zip through space more quickly. These warm dark matter models predict that dark matter formed long filamentary structures along which stars appeared like pearls on a string. In this simulation, a gas filament condenses and then fragments to form the first stars. The blue shading in this image reflects changes in the gas's density. An artist's impression of an embryonic galaxy brimming with star birth in the early universe, less than a billion years after the Big Bang. This image was prompted by the discovery in 2008 of a young galaxy, called A1689-zD1, that was born about 700 million years after the Big Bang. Gamma-ray burst GRB 090423 is the small, very red source in the center of this image. The red color is indicative of its great distance — about 13.1 billion light years — since all the optical light has been absorbed by intergalactic hydrogen gas, leaving only infrared light. All the other galaxies and stars in the image are much closer to us and just happen lie in the same part of the sky. GRB 090423 was the most distant object observed at the time of its discovery in 2009, and astronomers hope that distant gamma-ray bursts such as GRB 090423 will give them information about the early universe following the Big Bang. A graph showing the temperature of the intergalactic medium when the universe was between one and three billion years old, overlaid on an artist's impression of the emergence of galaxies over the same period. The shaded region shows the range of possible temperatures measured from the team's data. The warming occurred at a time when the growth of galaxies was in full swing.